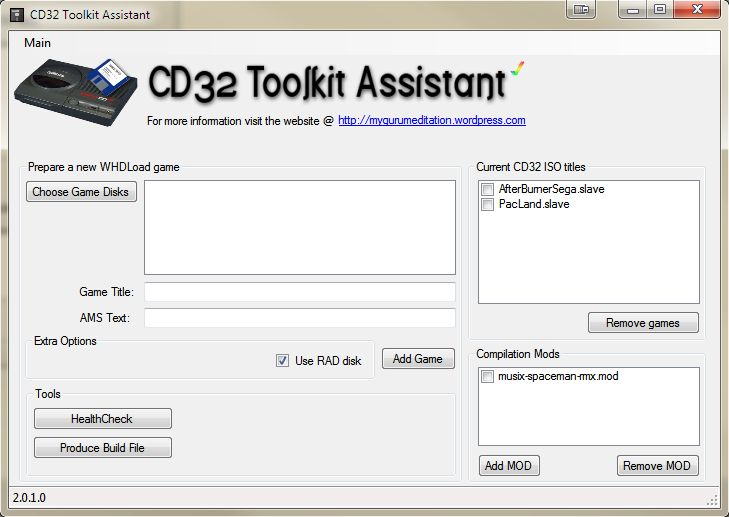 CD32 Toolkit Assistant 2.0.1.0: Out Now! It’s only been a few days since I last wrote a piece on how to create a games compilation for the Amiga CD32. In that post I linked to a guide on the Guru Meditation blog by Amiga4eva. Attempting to remove mods or game files from the compilation without having selected anything from the checked list boxes will no longer mistakenly inform the user they’ve removed an item. The ability to maintain a list of .mod format songs to be included in the compilation. Looks excellent. 🙂 If you’re interested in taking a closer look, please head over to Guru Meditation Blog by clicking here. Interested in seeing how such a compilation looks like? I found a video by Maxsoft9 on YouTube that showcases a cool CD32 compilation. The music in the background of the video is from the compilation itself. Enjoy the show! Impressive how many games they can cram onto one CD, isn’t it? What is the price for a CD32 these days? By the way.. noticed one on e-Bay for about £50, but the seller was located in the UK and didn’t ship abroad. 😦 Not a bad price! Not a bad price. I am sure some good deal will pop up sooner or later. Thanks for the shout-out mate 🙂 It’s appreciated. No problem, mate. 🙂 Keep up the good work with the CD32 Toolkit Assistant! Great stuff! I see that you also are tempted to grab a CD32. Seems like Amiga4eva has inspired us both! 😉 If you decide to go for one, then I’m sure you’ll be happy with it. Lot’s of cool games to collect and compilations to be made. Has anyone got version 2.0.1.0 for download? Can’t find it anywhere and the official site has dead links. Sorry, I don’t know, but I’ll have a look for it.